The family company was settled in 1970 by Frans Welvaarts and was taken over in 1989 by Kees van der Meijden and Wilma Welvaarts. 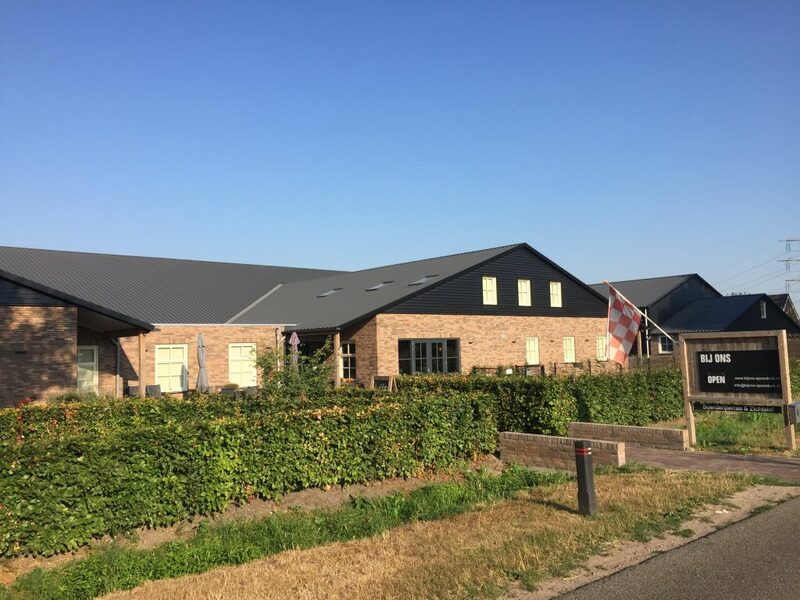 Kees and Wilma expand this company to a 1000 sow farm which produces high quality piglets. April 2016 was the opening for the brand new farrowing department. The goal for the new stable was to be fire proof, have a high health status for human and people and also to educate people for the pig industry. Furthermore the design of the building is unique, the building wants to invite people, not for sure related to the pig industry but important is to show what this pig farm is doing. Nothing is a secret in this farm, we want to show people how the pig industry is working, we want to explain you how we work and also why we do it like that. Not only telling our story to you is a goal but also your opinion is very important for us. We want to promote the pig industry, bring you knowledge and all together, this location shows enthusiasm and passion for the pig industry. We raise our pigs to feed families, so they’re cared for humanely. Together with our veterinarians and barn employees we keep our pigs as healthy and comfortable as possible. Our goals is to produce safe, nutritious, quality pork for our customers. We take the best care for our animals and this will result in top results. Whit this background, the thoughts about education were made. Training and education results in better employees and this results in better economical- en technical results. With the start of this building a lot of attention is paid on the healthy circumstances. A good hygiene is very important for this farm, everybody has to be 48-hours pig free before entering the farm. Showering and the use of company clothes makes the farm free of diseases. Logical walking lines and change of clothes per animal age group. The transfer of diseases between animal age groups is minimal and results in a very high health status. Also new innovations are applied in this farm, reduction of ammonium production is directly tackled by the source of the production. The manure is directly stored and cooled which results in a reduction of ammonium production. The dual manure tray is made from plastic end a cooling plate. The heat of the manure heats the cooling plate and the water which flow through this plate will be heated up. The energy (hot water) which comes out the cooling plate is used for heating up the farm terrace, office, education rooms en conference rooms. The air quality in the farm is important for animal and human. For a healthy and fresh air quality the farm has an innovative ventilation system which has a fresh nose system. When there is no electricity in the farm the fans will automatically open and natural ventilation keeps fresh air for the pigs in the barn. There are also two different water networks, one for the pigs and one for the other application in the farm which need water. 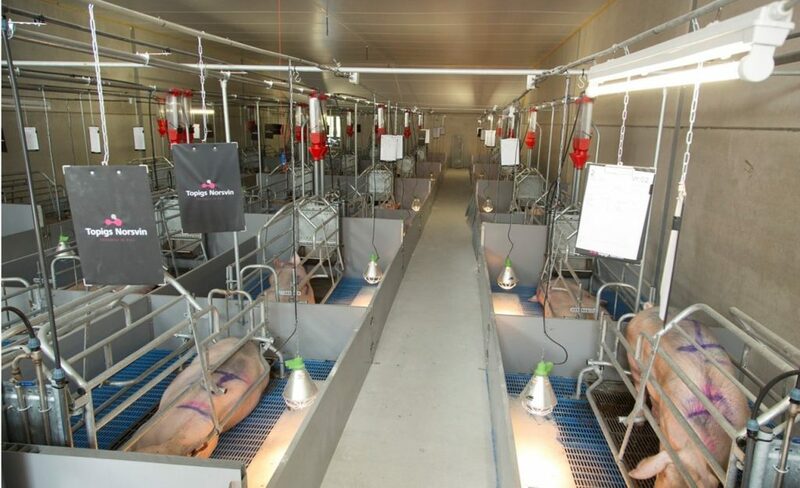 The farrowing room consists out 5 compartments. Every compartment is separated by full concrete walls. The rest of the materials who are used inside the barn are made of fire resistant materials. A fire safe floor, no sockets in the farm, no electric wires on the roof and a water system which start when the temperature heat up with 5 degrees in a couple of seconds. It’s important to measure the condition of the sows. The farm measures the weight of every individual sow by entering- and leaving the farrowing room. By measuring the weight is easy to make a strict feed schedule for every sow. Furthermore, the temperature, water flow, climate and water quality is measured 24/7 per year. By measuring this monitoring points the result can be improved in the farm. With the viewing shed it’s possible for everyone to take a look into the barn. The farm pay attention to be distinct. Show how the pigs live, how the staff take care of the pigs , how the pigs are raised. See this behind the glass. Also tourists visit our farm because of the farm terrace we have. Drink, eat and relax with the pigs behind your breakfast, lunch, dinner or snack is quit unique in the Netherlands. This farm have the possibility to do this. By showing the farm inside we explain to the civilians how the Dutch pig production works.